Dragon Pendant. Late sixteenth century, Spanish. 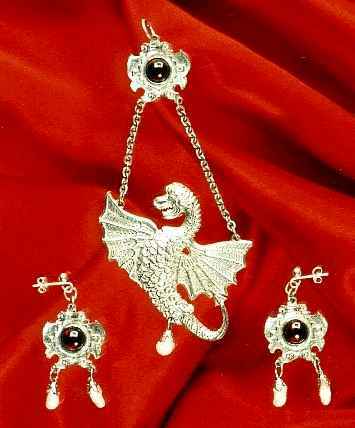 The dragon hangs on stainless steel chains from a crest, upon which is a garnet cabochon. Below the dragon hangs a freshwater pearl. Supplied with a chain, but the pendant should really be worn on a velvet ribbon, tied close to the neck and fastened at the rear with hooks and eyes. Price £19.50. Matching earrings. With garnets and freshwater pearls. Price £17.50. Garnet Pendant. Dated 1610, English. Originally designed by Arnold Lulls, who worked for Anne of Denmark and James I. 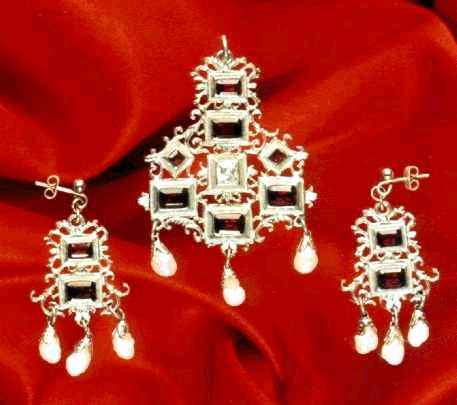 The central diamond (cubic zirconia) is surrounded by garnets. From the pendant hangs three freshwater pearls. 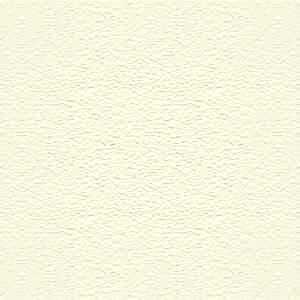 Supplied with a chain, but again, it should be worn close to the neck on a velvet ribbon. Price £35.00. Matching earrings. With garnets and freshwater pearls. at the rear with ribbon. Length 53cm. Price £25.00. Also available in gilt plate. Price £30.00. 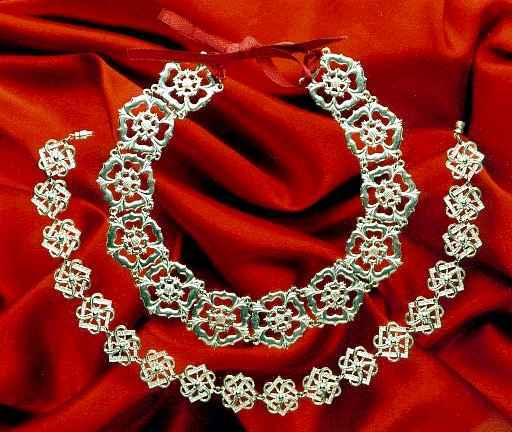 French Chain (outer). Dating from the mid seventeenth century. Price £25.00.